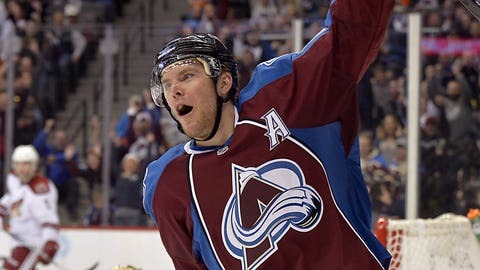 Avalanche C Paul Stastny celebrates a goal against Phoenix in the 3rd period. DENVER — Gabriel Landeskog had a goal and two assists, Paul Stastny had a goal and an assist and the Colorado Avalanche beat the Phoenix Coyotes 4-2 on Friday night. Semyon Varlamov stopped 40 shots in his first game after playing for Russia in the Sochi Olympics, and P.A. Parenteau and Nate Guenin also scored for Colorado, which bounced back from blowing a two-goal lead in a loss to Los Angeles on Wednesday. Guenin’s goal was his first in nearly two years after spending all of last season in the American Hockey League. Shane Doan had two goals and Thomas Greiss had 29 saves for Phoenix, which lost 3-2 in a shootout at Winnipeg on Thursday night is 0-2-1 in its last three games to hurt its playoff chances in the season’s final six weeks. The Avalanche are comfortably in the playoff picture, but are chasing Chicago and St. Louis in the Central Division. With 22 games remaining, they trailed the Blackhawks by three but they have a game in hand on Chicago, which sits second in the division. The Coyotes had a chance to pull this one out before Colorado broke it open early in the third. Guenin’s first goal since March 19, 2012, came when he beat Greiss from the top of the right circle 48 seconds into the third period to give Colorado a 2-1 lead. Stastny scored on Nathan MacKinnon’s rebound at 6:12 of the third to make it 3-1. Doan’s second goal of the game at 13:58 of the third made cut it to one, but Landeskog restored the two-goal advantage with his 19th nearly three minutes later. The teams traded power-play goals in the first period. Doan gave the Coyotes a 1-0 lead with his 16th goal at 12:47, and Parenteau answered 2:51 later with his 12th to tie it. The teams had several scoring chances in the second period, but each goalie made 10 saves. NOTES: Nathan MacKinnon had two assists to extend his point streak to 10 games, the longest active run in the NHL. … Avalanche D Erik Johnson was out of the lineup to serve the second of his two-game suspension for his slash on New York Islanders C Frans Nielsen on Feb. 8. … Coyotes D Oliver Ekman-Larsson’s assist on the first goal gave him a career high for a single season with 22. … Colorado LW Maxime Talbot returned after missing Wednesday’s game to be with his fiancee, who gave birth to the couple’s first child, son Jaxon.